[130 Pages Report] The digital intelligence platform market was valued at USD 5.24 Billion in 2016 and is projected to reach USD 13.96 Billion by 2022, at a CAGR of 19.8% during the forecast period. The base year considered for the study is 2016 and the forecast period is from 2017 to 2022. The research methodology used to estimate and forecast the digital intelligence platform market size begins with capturing of data of key vendor revenues through secondary research (annual reports, white papers, certified publications), databases such as Factiva and Hoovers, press releases, and investor presentations of digital intelligence platform vendors as well as articles from recognized industry associations, statistics bureaus, and government publishing sources. Vendor offerings were also taken into consideration to determine market segmentation. The bottom-up procedure was employed to arrive at the overall global market size from the revenues of key market players. 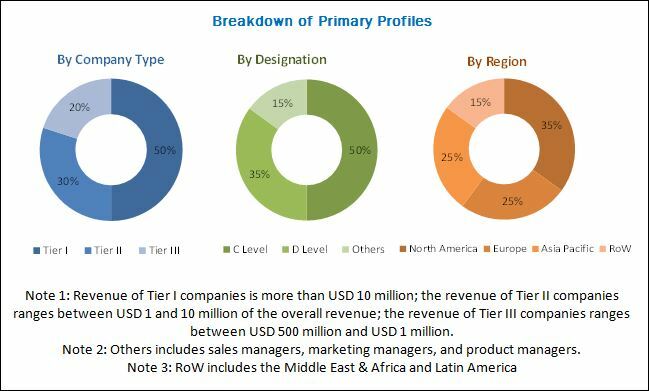 After arriving at the overall market size, the total market was split into several segments and subsegments, which were then verified through primary research by conducting extensive interviews with key individuals such as CEOs, VPs, directors, and executives. Data triangulation and market breakdown procedures were employed to complete the overall market engineering process and arrive at the exact statistics for all the segments and subsegments. The digital intelligence platform market ecosystem includes key players such as Adobe Systems (US), IBM (US), SAS Institute (US), Evergage (US), Google (US), Mixpanel (US), Optimizely (US), Webtrekk (Germany), New Relic (US), Localytics (US), and Cxense (Norway) that provide digital intelligence platforms. The global digital intelligence market is projected to grow from USD 5.65 Billion in 2017 to USD 13.96 Billion by 2022, at a Compound Annual Growth Rate (CAGR) of 19.8% from 2017 to 2022. Factors driving the digital intelligence platform market include increased adoption of digital intelligence platforms for competitive differentiation and customer retention activities, rising focus on social media analytics and personalization, and the need to optimize digital experiences across all touchpoints. 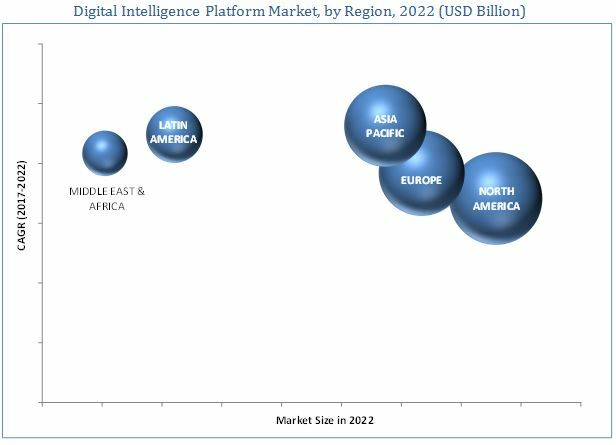 The digital intelligence platform market is segmented on the basis of component, touchpoint, organization size, vertical, and region. On the basis of component, the market has been segmented into data management, analytics, and engagement optimization. The necessity to extract real-time actionable insights from digital customer data to make informed decisions has driven organizations to adopt digital intelligence platforms with digital analytics capabilities. Based on touchpoint, the digital intelligence platform market has been segmented into the web, company website, mobile, email, social media, kiosks & Point of Sale (POS), and others. The mobile touchpoint segment is estimated to lead the market during the forecast period, due to high adoption of mobile devices and their significant importance in making purchase decisions by consumers. Based on organization size, the digital intelligence platform market has been segmented into SMEs and large enterprises. The SMEs segment is estimated to grow at the highest rate during the forecast period. Digital intelligence platforms enable SMEs to retain and enhance customer experience with the purpose to sustain in the market as well as to create competitive differentiation among competitors. Based on vertical, the digital intelligence platform market has been segmented into retail & e-commerce, BFSI, travel & hospitality, telecommunication & IT, public sector, media & entertainment, healthcare, and others. The others segment includes education, automotive, and manufacturing industries. The BFSI vertical segment is estimated to lead the market, owing to the increased focus on customer satisfaction by organizations in this industry. The digital intelligence platform market has been studied for North America, Europe, Asia Pacific, Middle East & Africa, and Latin America. The digital intelligence platform market in the Asia Pacific region is expected to grow at the highest CAGR during the forecast period. This can be attributed to the rapid growth in smartphone adoption and increasing e-commerce and m-commerce in the region. The mobile, the social media, and the web are the top three touchpoints in the Asia Pacific region. There has been an increase in online mobile shopping and social media usage in this region. Hence, organizations in this region are focusing on increasing customer experience through mobile and social media touchpoints. Some of the factors restraining the growth of this market are lack of digital skillset and resources and data silos and complexity of data integration. Organizations deploying or planning to deploy digital intelligence platforms are leveraging virtual touchpoints, which offer digital intelligence platform market vendors the opportunity to increase their offerings for the same. Rapid advancements in Artificial Intelligence (AI) and IoT technologies and digital engagement through virtual reality and augmented reality are some of the growth opportunities offered by the market. The major challenges faced by organizations are issues related to data security and privacy, and varying structure of regulatory policies. Key players in the digital intelligence market are Adobe Systems (US), IBM (US), SAS Institute (US), Evergage (US), Google (US), Mixpanel (US), Optimizely (US), Webtrekk (Germany), New Relic (US), Localytics (US), and Cxense (Norway). These companies are adopting different growth strategies such as new product launches, partnerships, collaborations, mergers and acquisitions, and business expansions to increase their market share.